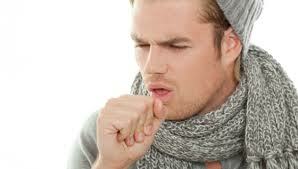 Bronchitis is a term that describes inflammation of the bronchial tubes. In Chronic Bronchitis, this inflammation causes excessive secretions of mucus into the tubes that along with tissue swelling results in bronchial tube narrowing. Chronic bronchitis is defined as a cough that occurs every day with sputum production that lasts at least two months for at least two consecutive years. Chronic Bronchitis is one type of Chronic Obstructive Pulmonary Disease (COPD), a disease that is distinguished by chronically poor airflow. The other conditions associated with COPD include Asthma and Emphysema. The normal function of cells that line the airways of the lungs is to produce mucus, which acts as a part of the body’s defense mechanism against bacteria, viruses, and other foreign particles. The mucus helps catch the particles while tiny hair-like projections in the airways called cilia clear the mucus out of the lungs. In chronic bronchitis, there is an overproduction of mucus that the cilia are unable to clear from the lungs. Over time, the cilia lose function and become less efficient at removing mucus from the lungs. This excess mucus results in airway narrowing and also provides a haven for bacteria to grow, thus making patients more susceptible to serious lung infections. About 10 million Americans are affected by some form of COPD, which is the fourth leading cause of death in the United States. Cigarette smoking is the most important risk factor for developing chronic bronchitis and 90% of patients have a history of smoking. Other risk factors for chronic bronchitis include: long term exposure to chemicals and dust, exposure to secondhand smoke, family members with COPD, history of frequent lung infections, and long term asthma. The diagnosis of Chronic Bronchitis is confirmed clinically after a patient presents with symptoms of a productive cough that has been present for 3 months for at least 2 consecutive years. However, additional tests are used to determine prognosis and staging of the diagnosis. A breathing test may be ordered to assess lung function. Blood tests may be ordered to look for signs of infection and carbon dioxide levels, and a Chest X-ray can be used to look for infection or disease progression. 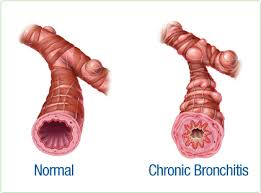 There is no cure for chronic bronchitis so treatments aim at reducing symptoms and improving lung function. The best way to reduce symptoms and slow disease progression is to stop smoking. Medications can be prescribed to improve lung function. These medicine help manage chronic bronchitis by opening and relaxing the airway and by decreasing inflammation. Oxygen therapy can be helpful if oxygen levels in the blood are too low. Pulmonary rehabilitation can strengthen chest muscles and decrease the workload on the lungs by building endurance. Additionally, all patients with chronic bronchitis should receive yearly flu vaccines unless contraindicated. They should also receive the vaccine that protects against many forms of pneumonia. Because there is no cure for chronic bronchitis, the patient should learn to manage their lifestyle. For example, patients should set attainable targets for physical activity and learn different relaxation techniques to alleviate stress. Patients should try to reduce stress as anxiety can increase the breathing rate, which will make breathing more taxing.